Ocean Star 3 Fish Hunting Video Redemption Machine Available Now! Adding to the already successful range of exciting fish hunting video redemption machines, Ocean Star 3 is set to be a big hit! Available now as a full machine or upgrade kit, you will be able to update your venue or old machine with this exciting game! The Ocean Star fish hunting video redemption game has already enjoyed a phenomenal popularity over the last year or two, and continues to show it's popularity, this latest game will be no exception! 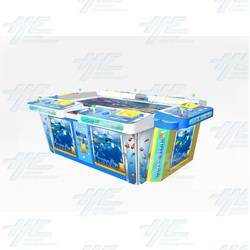 The Ocean Star 3 is available as a full 6 player machine, or, PCB Upgrade Kit which supports 4, 6, and 8 player video redemption arcade cabinets. As the name indicates, it continues on with the oceanic theme and is the third installment from the Ocean Star line.The latest version of Ocean Star has made many changes from it's predecessors for a new, fun, and exciting game. Players enjoy new game play,as well as sharper and more vibrant scenery than ever before thanks to HD graphics through a 3D engine. See every line and colour of the fish characters and ocean floors in greater, brighter detail as you play! Ocean Star 3 fish characters include: Lion fish, Butterfly Fish, Flying Fish, Jellyfish, Lantern Fish, Flat Fish, Clown Fish, Sea Turtles, Fugus, Sharks, Stingrays, and the character feature - Big Whale! For more information on this exciting product, please follow this link or, if you are interested in this product or any other fish hunting cabinets we have, please contact our friendly sales staff for more information.